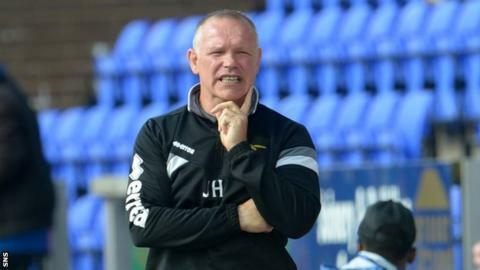 Inverness manager John Hughes does not believe his side can maintain their unbeaten run to the start of the season after their 2-0 win against Kilmarnock. Hughes' side have now gone five matches without defeat and have yet to concede a goal. "I very much doubt it," said Hughes about a lengthy run. "Being honest, we're going to try as hard as we can." "We've said to get as many points on the board as quick as we can - whatever it takes to stay in the league." Two goals in the final 15 minutes of the match in the Highlands sealed another win for Hughes' men, when Aaron Doran rolled the ball into the net in the 75th minute, then Greg Tansey struck the post with a 25-yard shot that rebounded off Killie keeper Craig Samson and in for the second. It was welcome relief for the home fans after a dry first half which produced little in the way of clear-cut chances. Hughes insisted the win was down to careful build-up and pressing for better quality football after the interval. "We have to be patient, and I said that to the players at half time. I felt some of our play wasn't too bad - we just lacked that final cutting edge in the final third," said Hughes. "We tried to put it right in the second half, and we came up trumps. The first one was great football goal and thankfully it went in." Hughes jokingly refused to reveal his dressing room secret to turning around the goalless first half, but admitted it was a difficult encounter against stoical opposition. "I just asked the players for a little bit of the stuff we work at on the training pitch, that final link-up or even a better quality cross," said Hughes. "But it was our day, and I'm just grateful and thankful that we picked up the three points, because Kilmarnock were resolute. "They had a great shape about them, they hit us on the counter - it's up to us to go and break that down."